The Jaguar XF is back, not with a whimper but with a bang. For too long now, the the German’s have controlled the lucrative executive car sector, but Jaguar have finally left the drawing room and dropped a bombshell of a car that could give the genre the shake-up it’s been crying out for for years. The XF saloon is lighter than its predecessor, offers more room, and looks the absolute business. Look out Audi, Mercedes and BMW, because Jaguar are coming for you. Let’s take a closer look at what this saloon has to offer with our review. 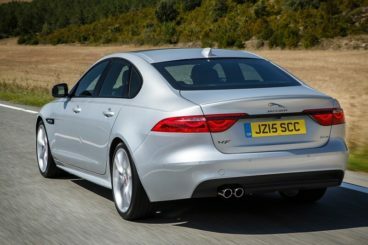 The Jaguar XE recently nudged its way into the compact executive saloon sector and quickly became recognised as one of the best to drive in its class, and the same can be said about the new XF. This is a car that is fun to drive and offers some seriously good handling, which puts it on par with the ultimate driving machine. And although its new diesel units are more concerned about keeping running costs down, there are still a few sportier plants available for folk who want ‘em. If you opt for the 180 variant, you can also pair it up with four-wheel drive. This particular variant covers the 0-62mph sprint in 8 seconds before maxing out at 136mph. Other engines in the range include a 3.0-litre V6 diesel that is good for 380PS, as well as a 3.0-litre supercharged V6 petrol. The diesel can get you from rest to 62mph on 5.7 seconds. Jaguar have also introduced All-Surface Progress Control here, which makes it easier for drivers to handle tricky conditions, such as snow and ice. It’s similar to cruise control and just gives you that bit more confidence. The new Jaguar XF looks more purposeful than last time around, thanks to a few subtle but significant revisions. The classic curves are still there, but they’ve been given a work-out so that they now appear to be more muscular, while the designers have also worked hard to give this saloon a bit of dynamism. It’s leaner than last time, too, and weighs 190kg less. 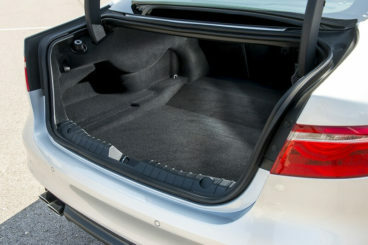 Indeed, the diesel 163PS variant actually weighs some 80kg less than its closest rival. But although some fat has been trimmed, the Jag saloon is still very much a big car, and benefits from a wheelbase that is longer than its predecessor’s. This means there is more legroom and headroom, while drag co-efficiency has dropped to a remarkable 0.26. 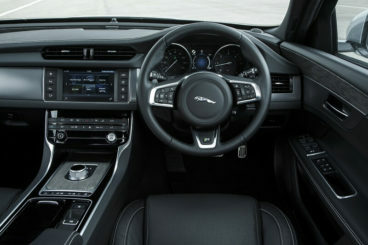 Jaguar decided to revise the interior a fair bit, so although the horizontal lines of the previous XF’s fascia remain, they are now built from better materials. The design is also improved, too. The dash, meanwhile, comes complete with an impressive 8” infotainment system with touchscreen, although it’s not quite as intuitive as the BMW iDrive system. The traditional speedometer has finally been abandoned though, with a big screen behind the wheel replacing it. The popular rotating air vents are still present. 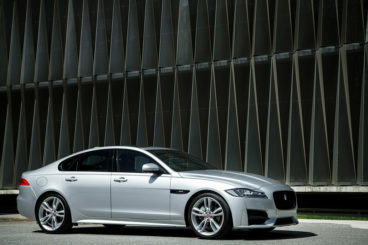 Prices for the new Jag XF start out from around £32,000 and rise to £50,000. Standard equipment is good for the baseline variant, and includes alloys, leather steering wheel, leather seats and an 8-speaker stereo. The R-Sport throws in 18” alloys, as well as supportive sports seats, while the Portfolio trim chicks in keyless entry and an eleven speaker Meridian sound system. The top of the range XF S variant spoils buyers with 19” alloys, sports suspension and 3.0-litre engines. In terms of running costs, the new XF needed to better the numbers achieved by the outgoing model if it was to remain relevant to both business and private buyers who enjoyed its solid reliability record. The good news is that the new XF shows more improvement and better numbers. The popular 180PS variant returns an impressive 65.7mpg and emits just 114g/km of CO2, although if you opt for 4WD drive, these numbers will tumble to 129g/km and 57.7mpg. Jaguar stumbled during the nineties and into the new Millennium, so much so that each time they wheel out a new model, we can’t help but expect it to miss the target. Yet they’ve proven everyone wrong once more with a compelling rival to the The Big Three German’s in exec car sector. No doubt the outgoing XF was looking out of place next to its sleek competitors, which is why Jaguar really need to exhaust themselves if they were going to pull a rabbit out of the bag here. 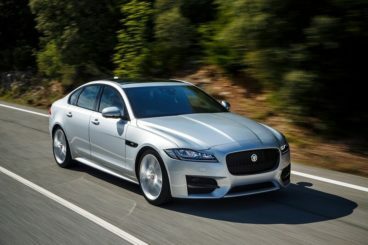 That they did, and this masterful Jaguar XF saloon is a beauty of an exec class car that offers reliability, handsome looks and a sophisticated, super contemporary interior.